If you don’t then click on the image to be taken to the Flickr page where a specific portion of the photo is highlighted. So what does this mean? 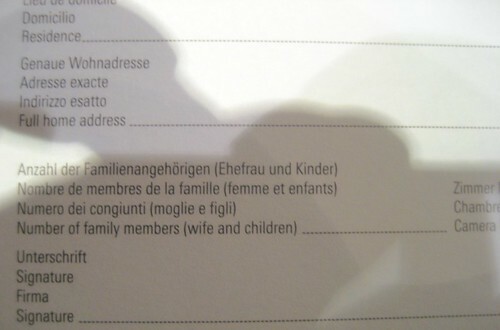 Only men and lesbians are assumed to be heads of household in Switzerland? (Given the list and order of languages, this is most likely a card specific to Switzerland, possibly just this one hotel.) If you’re travelling as a husband-wife-child(ren) combo, only the man could possibly be the one filling out the form? And how about other travel/family arrangements? People who know a bit about Swiss history won’t be surprised by all this. For example, Swiss women didn’t get voting rights until 1971 (! ), many decades later than in numerous other countries that are relevant comparisons. All that said, to be fair, I don’t recall the wording on hotel cards in neighboring countries so perhaps they make similarly ridiculous statements. Next time you’re filling out such a card, do you mind checking and reporting back? (If comments are closed here, feel free to just email me.) I’m curious to know how widespread this is. This entry was posted on Sunday, September 9th, 2007 at 5:34 am	and is filed under Soc/Pol/Econ, Travel. You can follow any responses to this entry through the RSS 2.0 feed. Both comments and pings are currently closed. lemme guess…eszter was in switzerland? I think the bit stating “[r]ecently in Geneva, I” pretty much gives that away.